Those people who choose to join a choir are joining for a variety of reasons, but particularly because they love singing as part of a group. This means that everyone in a choir has a vested interest in being there, and being together. 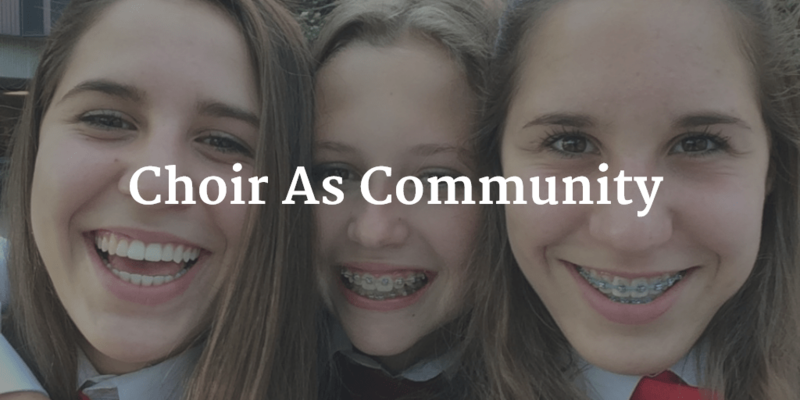 There is an inherent understanding that singing together means providing your voice as one of many, and this lends itself well to being part of a larger community. A choir is an excellent way to meet new people who love something that you love! While choir members are all there because they love music, they also bring their own unique talents and interests into the group, which creates a wonderful tapestry of diversity. It is such a boon to a community to have unique and interesting talents to share with one another, and it exposes choristers to a variety of backgrounds, cultures, languages, and interests. Success in a choir depends on each member of the choir supporting the others. This is done musically, by providing a voice as one of many, to create a fluid and blended sound. But it is also done socially and emotionally, by investing in the people sitting next to one another in the room. Choir provide a safe and welcoming environment, in which everyone feels as though they belong, and are supported by the group. How else is choir a community? Tell us in the comments below!